I’ve watched too many presenters struggle to connect their laptops to a venues AV system or embarrass themselves with laptop failures. Here’s some steps and setups I use to try to avoid this. Let me know if I’ve missed something, you disagree or what I’ve said doesn’t make sense! Always make sure your laptop is connected to a mains electricity supply or is fully charged. Don’t place your laptop next to or below any containers with liquids. One accident will ruin everything. Have a memory stick with a backup of the presentation. Save the files with the fonts embedded and with the individual video clips. I have a dedicated laptop for presenting and minimise the amount of programmes installed on it. I still use Windows XP as it’s so reliable compared to later versions. plus any files I create are more likely to be compatible with other systems. Make your laptop desktop look presentable. Think about the background. Why not use a custom logo or a simple plain background. If you’re cloning the screen to the projector don’t have a mass of Icons or shortcuts. Use “presenter mode”. Means you can navigate slides easier, see the time, view upcoming slides, read notes etc. Set your laptops volume to 2/3rds. That way the venue’s speaker volume can be set to this value and you then have the option midway through a presentation to increase or decrease the volume (I use my remote to do this) rather than rely on a non-existent sound technician. Turn off “system sounds”. Like startup, shutdown and system beeps (ie. plugging in a memory stick). Really annoying to hear that over a venue’s PA system. Turn off any auto updates. Never rely on having internet access to show content. Have hard copies of any files/videos on the laptop. Don’t have it connected to the internet during a presentation as that will slow things down or start unwanted installations. Make sure the screensaver won’t override your presentation software. For some time I struggled to connect my laptop to projectors over some CAT-5 systems – the laptop wouldn’t recognise a connection. Eventually I discovered an internal setting in my laptop’s configuration. There was a choice to auto-detect a VGA connection (the default) or to leave the VGA socket switched on permanently. By switching to the latter it solved this problem. I carry this tech bag with me every time I give a presentation. It has saved me countless times of having the embarrassment of not being able to connect my laptop to the venue’s AV system (see a later blog post of setting up your laptop for presentations). Plus as a professional speaker I think it’s my responsibility to be as fully equipped as possible. Currently the clear zip bag and contents weigh 800g and are no bigger than an A4 piece of paper and the thickness of 3cm. My philosophy is to be over prepared so the majority of the items rarely get used. But 1 time in a 100 they save the day. 1.5m long VGA cable (male to male). 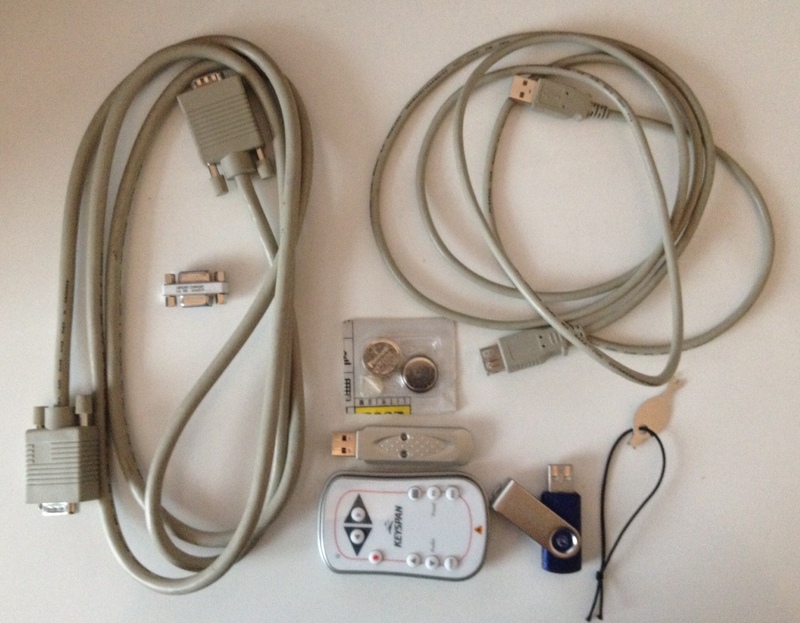 A standard cable to connect a laptop to projector. Female to Female VGA connector. This comes in handy when I want to extend the cable or if I need to convert my male ended cable to have a female end. Remote control receiver and transmitter. I use a small Keyspan device that is ultra reliable, small enough to comfortably hold without being obvious and has a volume control including mute. Never buy Infra red remote controls as they work on line of sight. RF remotes are the way to go. Spare batteries for the remote control. USB extension cable (male to female). This is handy in very large venues where the laptop is connected at the back of the room. The cable can be connected to the remote receiver and then used to raise the receiver up higher to increase reception. In some presentations I use a webcam to act as a visualiser and so the USB extension can be used to increase the webcam’s range of movement. USB Memory stick with the presentations stored in case of laptop failure. A caretakers or cleaners key to switch lights on. This came about from a recent event where the theatre venue’s tech guy hadn’t arrived, the theatre was in darkness and I needed to setup. To operate the lights you needed one of these keys – so I had to wait. So after the event I went online and purchased a key for that rare occasion to repeat itself. Photo 3 contains the connectors and cables for sound. I use the headphone out socket from my laptop. The first two items are essential. 3.5mm male jack to 3.5mm male jack cable. 3.5mm male jack to phono cable. Ground loop isolator. With some audio systems there is a really annoying hiss in the system when a laptop is connected. The ground loop isolator helps reduce this significantly. 3.5 female jack to 3.5 female jack connector. Useful to extend cables. 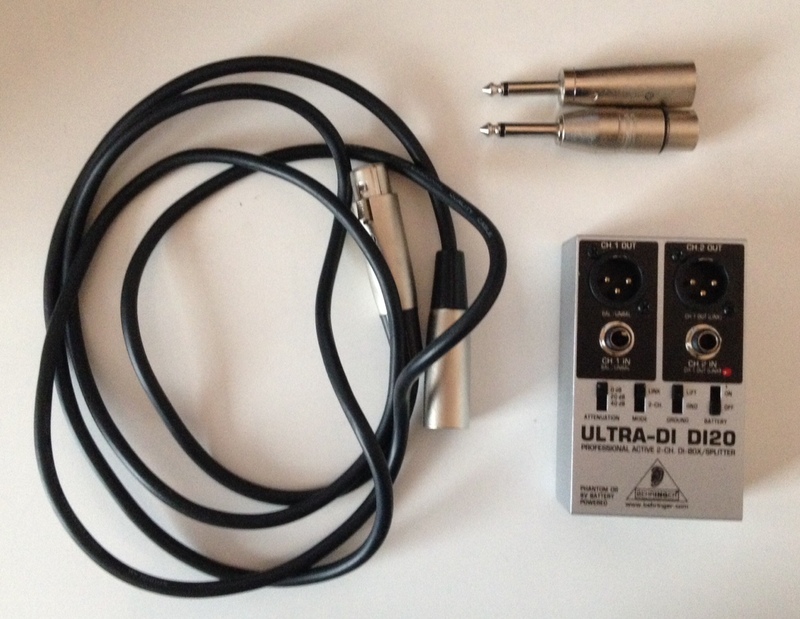 The other connectors and mini cable are useful when connecting up the ground loop isolator, using a DI box or for strange sound desk inputs. DI box. Ideal for sending audio over long distances and reducing electrical pick up noise. 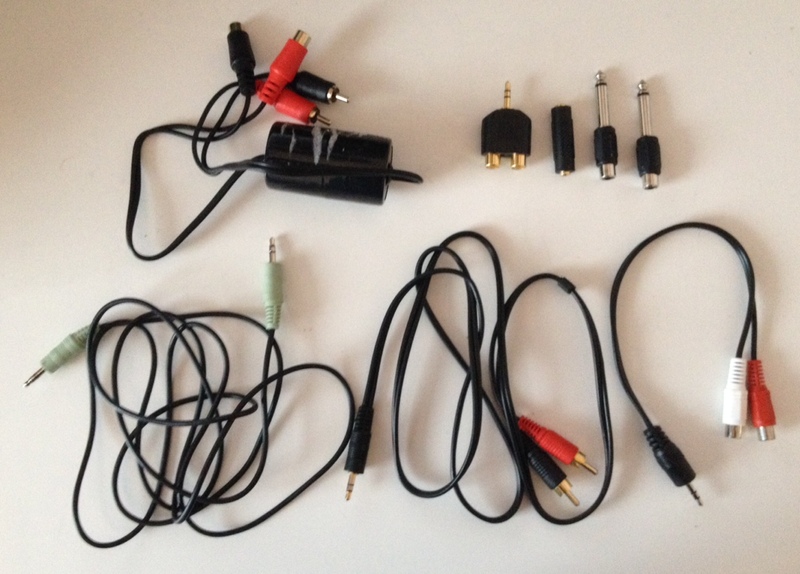 XLR (male and female) to jack converters. In addition to the above I will, if the venue requires, bring my own Projector and lapel radio mic system. I can’t remember where I first heard about this simple tip to save the embarrassment of standing in front of an audience with your trousers unzipped. 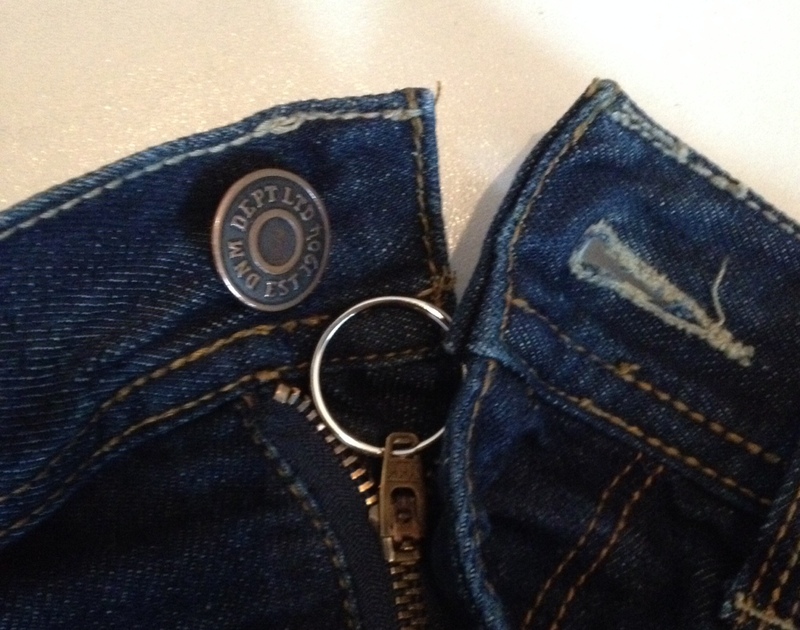 Add a split ring to the zip that’s just large enough to go over the button when zipped up. Then it’s impossible to for the zip to open unexpectedly.